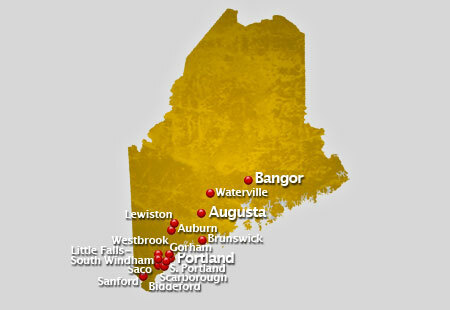 AirSign provides extensive aerial advertising coverage throughout all areas of Maine. From beach aerial advertising to sporting events and over busy highways, we'll display your message to crowds in a way your audience will be certain to remember. Believed to be one of the world largest producers of paper, Maine has almost 89 percent of its total land area covered in forests. It also has more than 2,500 lakes, 5,000 streams and 30 state parks for tourist attractions. The state is a great destination place famous for its selected scenic beaches, mountains, lakes and resorts. One of the popular attractions in Maine is the Acadia National Park. It is known for its scenic views of different sandy beaches and nature centers with variety of land and sea creatures. Other well known destinations are the Bar Harbor, the Roosevelt Campobello International Park and the Croix Island National Monument. Climate in Maine is humid continental climate with warm and humid summers, frequently accompanied with thunderstorms, and very cold winters oftentimes with snowfalls. Some of the professional sports league teams in Maine are the Maine Red Claws of the National Basketball Association Development League and minor league teams Portland Pirates of American Hockey League and Portland Sea Dogs of the Eastern League U.S. Baseball. There are a number of quality educational institutions offered by accredited educational institutions in Maine. Few of these universities and colleges are the University of Maine System, with 9 campuses all over the state and University of Maine in Orono as the flagship campus, and the Maine Community College System, with 8 campuses and one boating school, Boat School at Eastport. Crowds are an aerial advertiser's paradise! A typical flight over popular events or locations can result in as many as 8,000,000 impressions! Have us fly your aerial banner over the crowds in Maine to put your message wherever you want, whenever you wish at the best value in mass marketing!